The Woodland Labyrinth is a high-level dungeon that is a much more difficult version of the Forest Maze. This dungeon is a source of Potions of Vitality, Potions of Attack, and Potions of Life, and is the only source of the Leaf Bow, an untiered bow. 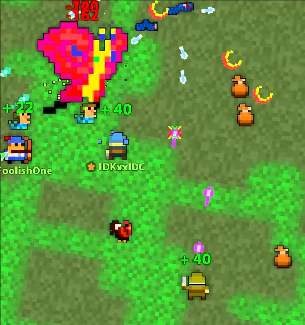 The portal to the Woodland Labyrinth is a guarnteed drop from the Lucky Ent God, which only spawns once per realm, when it is created. 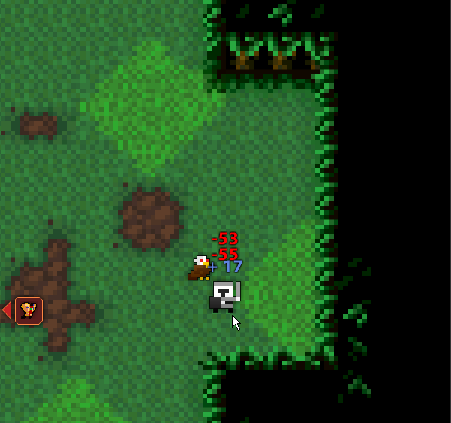 The Woodland Labyrinth Key is available in the Nexus for 50 . 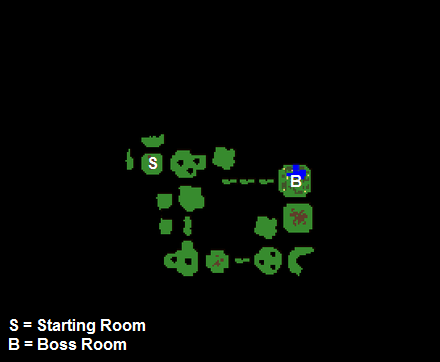 See the Woodland Labyrinth Guide for a complete walkthrough on the dungeon and all its enemies. This dungeon was released alongside the Deadwater Docks and The Crawling Depths, which are two other “Epic Dungeons”. This dungeon used to be highly unpopular among players due to the limited loot it awarded, considering its difficulty and rarity. Potions of Vitality can be farmed from the Abyss of Demons, a much easier and more common dungeon. With the X20.0.0 patch, the loot now fits the difficulty of the dungeon. Fairly easy to battle with a decent sized group. It fires many Yellow Energy Shots in a radial pattern. It throws Larva Puke, which turns a tile on the floor into a pool of Puke Water. Standing in Puke Water results in 55 damage per second. This will turn into the Mammoth Megamoth, the second phase of the battle. Could be considered somewhat difficult if battling in a small group. It will shoot out an array stars with 125 damage and Quiets for 3 seconds. It will spawn Micro Megamoths that shoot out bullets that Confuse for 0.5 seconds. Quickly chases the closest person. This will turn into the Murderous Megamoth, the final phase of the battle. It fires many bullets that damage 125 each and has either a Weaken or Quiet condition effect. Spawns several Mini Larva that shoot a large array of bullets. Stacked bullets from the larvae that are spawned upon switching to phase 3 have the potential to kill most maxed characters. You have been warned. Drops Potions of Vitality/Life/Attack, the Untiered Leaf Bow, T12 Weapons/T13 Armor, and Wine Cellar Incantaions. Before you enter the room, it is advisable to make sure that nothing is going to follow you in with the boss, because enemies in this dungeon can be very dangerous when you are too focused on the boss. When you enter the room, the boss will be in its larvae stage, the Megamoth Larva where he fires high damage projectiles in all directions and “throws up” all over the room, creating puke tiles that hurt you just as lava would. As long as you don’t hug him, it isn’t too hard to survive. After enough damage is dealt, He becomes invulnerable and starts flashing red in the middle of the room. It is advisable to back up at this point in time because the boss is switching to his second stage, the Mammoth Megamoth. As he switches, a massive array of quieting and confusing bullets scatter all over the room. The boss shoots a 3 bullet shotgun that quiets and deals a lot of damage, and all the minion moths around shoot lower damage bullets that confuse. You have to be careful because getting hit by a single confusion bullet can cause send you spiraling into the boss for an instant death. After enough damage is dealt, sadly the boss becomes invulnerable one last time to switch the the final stage, the Murderous Megamoth. Its final phase is aptly named; it follows you around the room just like Limon does, except this boss has around 6 mini larvae following it around shooting massive shotguns in EVERY direction dealing 80 base damage. These stacked on top of each other can easily kill maxed characters if you aren’t careful. It is typically easier to survive if you circle the room and stay as far away from the boss as possible with your finger on the nexus key at all times. Just remember to not be afraid to nexus at any time, and always keep an eye on your health. Quick Tip! : Having a large group attacking it, (First Stage, About 10+ people) dealing high damage, will kill it and not transform into 2nd/3rd phase.